2008: Over the last year or so, I have started revisiting the churches of Suffolk which I originally wrote about at the start of the decade. Coming back with a digital camera to St John the Baptist was a delight. However, I have seen no reason to change the text of what I wrote seven years ago; or, at least, not much. 2001: Just as we go to Long Melford to find out about the 15th century, so future historians will come to St John the Baptist to chart the course of the century just ended. For this church is the definitive statement in Suffolk of the liturgy and practice of 20th century High Church Anglicanism. Neither as eclectic as Spooner's Ipswich St Bartholomew, or as provincial as Phipson's Ipswich St Mary le Tower, this mighty church, the last work of the great Sir Arthur Blomfield, is the nearest thing Suffolk has to the grand and uncompromising High Church temples of west London. It has an unparalleled collection of 20th century stained glass; the best of this consists of a range of saints, spanning the century, from St Etheldreda in her high Victorian camp, to the modern images of Saints Hilda and Bede, both illustrative of the current Celtic revival in Anglican spirituality. Also worthy of note among them are the Arts and Crafts influenced James, Peter and John, the Lady Chapel glass east window of the Suffolk triumverate of Edmund, Felix and Fursey, and, as recently as 1982, St Thomas More, who exists elsewhere in a Suffolk Anglican Church at the extremis of Kettlebaston. Father James Mather informs me that More is at last recognised in the Anglican calendar in the new Common Worship lectionary, but this was not the case in 1982. As the foundations of Anglicanism were bought at the cost of More's life, it is bold indeed that this window commemorates More's martyrdom. Much of the glass is by Powell & Co, and forms a document of that studio's work as well. Felixstowe is the nearest thing Suffolk has got to a traditional seaside town, albeit not as brash as Walton-on-the-Naze and Clacton across the river in Essex, or Yarmouth over the Norfolk border. The town separates naturally into a number of areas, each with its own main churches: Felixstowe Ferry, Old Felixstowe, Felixstowe Town, Felixstowe West End, and Felixstowe Docks. 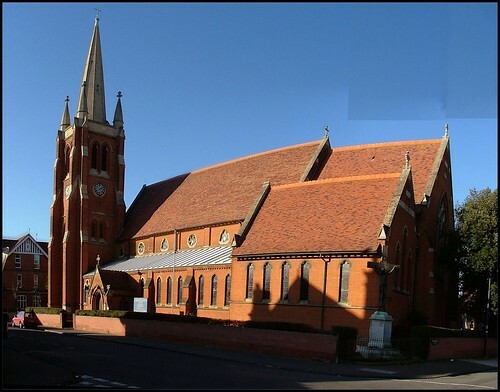 Suburbs include the medieval parishes (and medieval churches) of Walton and the two Trimleys, but only Old Felixstowe has a medieval parish church in the town itself. And only make my loneliness completer. &quot;The Little Sisters of the Hanging Pyx&quot;. We built our orphanage. We built our school. Now only I am left to keep the rule. And so my memory of the winter dies. And louder clang the waves along the coast. And all the world goes home to tea and toast. Bound for the red brick twilight of St.John's. "Thou knowest my down sitting and mine uprising"
Edwardian Felixstowe lost its holiday industry long ago. It is now but the favourite destination for daytrippers from Ipswich, the urban sprawl of which lies a bare six miles from the edge of Felixstowe's. But this area still has a holiday town atmosphere. There is a steep descent down the wonderfully named Convalescent Hill to the beach below, with crowds thronging the shingle and the leisure centre; but up here, it is another age, with the comfortable spring sunshine baking the red bricks of the quiet three-storey houses. St John the Baptist's concrete-white spire emerges above its lower stages, the redness of which intensify from a distance. Blomfield had built the rest of the church in the early 1890s, but the spire and the Lady chapel followed in 1899, the year of his death. You enter nowadays through Munro Cautley's 1940 south porch; the main entrance beneath the tower is no longer used. The first impression is of a dimness, the smell of incense, rich light from the coloured glass. Betjeman wrote of St John's red brick twilight, and the same is true today as then. The windows previously referred to line the walls of the north and south aisles and Lady chapel. 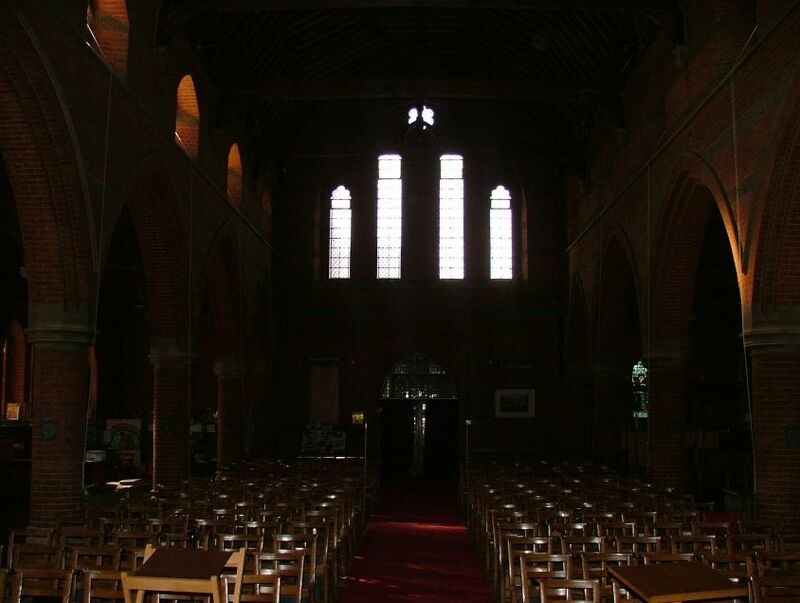 The last is in the south aisle, and is now partitioned off by glass doors to enable a prayerful silence when the rest of the building is in use, as at Ipswich St Bartholomew. The lowness of the aisles accentuates the over-arching nave roof, and draws the eyes to the 'Big Six' candlesticks on the high altar. No Vatican II altar in the nave here, for the chancel gates and Suffolk-style screen still contain clergy and choir stalls in front of the tiled and marbled sanctuary. So, as at Ipswich St Mary le Tower, High Church externals are maintained, whatever the liturgy. Either side of the high altar are gilded mosaics illustrating Christ's gift of peace. To the west, a little screened baptistery in the north aisle. The window behind it is the oldest in the church, and illustrates St Felix baptising and preaching. 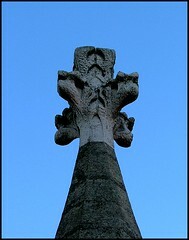 It is dedicated in memory of a child called Felix, who died in the 1890s. One of Blomfield's hallmarks is the way his buildings appear to be a cluster of smaller buildings around the great nave, like a medieval city. That illusion is successfully created here by the way the rooflines contrast, particularly that of the Lady chapel with the nave. From the south east, the direction from which you would commonly approach, this is particularly striking. The feeling of a citadel is further reinforced by the way St John the Baptist is shoe-horned into its site, with barely room to breathe except on the north side, where the former rectory lawn spreads towards the house. In the old days, it must have been pleasant to step from High Mass into a summer fete or garden party. But High Mass has gone, and the rectory is now derelict, alas. More romantic still is the convent that sits to the west of the church, which instantly recalls Betjeman's poem. As one stands outside, with the 'crashing tide' below, the sisters come and go, and it would be romantic to imagine that they are a surviving relic of the extraordinary flourishing of Anglican religious orders at the turn of the 19th and 20th centuries. Indeed, you might almost imagine that this is the very convent that Betjeman had in mind, despite the fact that he suggested himself that these orders were withering away when he wrote this poem in the 1950s. But in fact, this is a Catholic convent, the house of the Religious of Jesus and Mary. Postscript: wandering around my favourite east coast town over the years, I had often popped in to St John the Baptist to see how it was. I had never found it locked. In May 2007 I brought my new camera, and my daughter, and while we pottered about inside, the churchwarden came in. I don't know if he knew who I was, but he very kindly offered to take us both up the tower. Being mortally afraid of heights, but always wanting to conquer that fear, I accepted with enthusiasm. We climbed first to the ringing chamber, which has still its graffiti left by air raid wardens during the First World War. 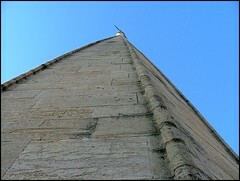 And then up and up, to the base of the spire, with the inside of the clock surreal beyond the belfry struts. And then out onto the top of the tower, beneath the great hollow spire. Hanging on grimly for dear life, I gazed out over the rooftops of this enchanting red brick town to the deep blue of the sea beyond. Turning back inland, I could see Ramsholt church, and the BT research HQ at Martlesham, and the grey smudge of Ipswich in the distance. Looking back out to sea, I could see the unilaterally declared independent state of Sealand on a World War II fort. Something was missing. And then it struck me. 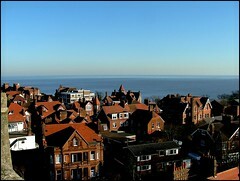 This is the only place in Felixstowe from which you cannot see its most beautiful building.